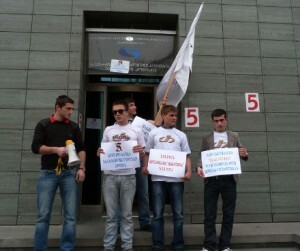 TBILISI, DFWatch – Around ten youth activists today protested outside the Georgian National Communication Commission against the fining of a regional television station. Irakli Beraia, one of the activists, says the fine is an attempt by the government to suppress free media. “Stop terror on media!” on of the youth shouted through a megaphone. Some held posters expressing solidarity to the media that are not controlled by the government and demanded that the USD 3 000 fine against Trialeti TV is withdrawn. GNCC explained that they sanctioned Trialeti for using radio frequency spectrum without a license and using a frequency it had not been granted. The company has a license as a private broadcaster and at the same time is a cable operator. GNCC says Trialeti transmitted its cable broadcast via radio frequency without a license. Badri Nanetashvili, the director of Trialeti told journalists that GNCC fined his company without having any legal grounds, but used made up reasons. He says the company broadcasts on a legally allocated frequency and the commission has only made this decision because of pressure from the top. “We are ready for observation any time. Any commission can publicly come and openly check us, but not those people who prepared this protocol,” he says. Nanitashvili says instead of reacting to this incident, the GNCC fined his company 5 000 lari. A GNCC representative told media.ge that the commission reacted to Trialeti’s appeal to check the frequency of DIA’s equipment. During the inspection they discovered that Trialeti had its own frequency line, however is using other frequency lines which are not licensed. GNCC says no violation was observed in case of DIA. TV and radio company Trialeti as a show of protest is refusing to pay the fine, even if broadcasts will be suspended. Company is going to solve this issue in the courts. Youth organizations today gathered in front of the GNCC building. About ten people participated in today’s protest, which they said is a warning protest and they are going to organize massive protest if the fine is not canceled. “Stop persecution of TV Company Trialeti. Trialeti is regional broadcaster which doesn’t bloc different opinion and people to express their position, we support them,” one of activist said today.